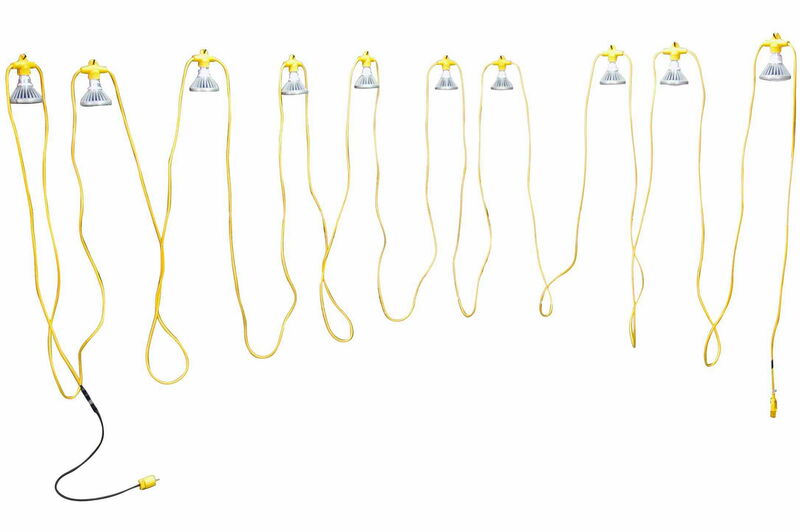 Industrial lighting specialist Larson Electronics reveals their new temporary construction LED string lights. The ten 25 watt LED lamps on this work site light set provides higher quality light than 150 wattage PAR38 lamps while creating less heat and using less power. The WAL-SL-10-PAR38-LED work area string lights from Larson Electronics consists of ten industrial grade LED lamps with 10 feet of 14/2 SJTW cable between each lamp. This temporary LED string light system is connected to power via an integrated 3’ cable terminated with a standard 5-15 weather proof straight blade plug. Each globe light is equipped with a high output LED bub which delivers more light output than a 150 watt PAR38 lamp. Each individual socket is equipped with a hook eyelet making them versatile for a number of industrial applications requiring reliable and bright illumination. This LED light set is a far more energy efficient bulb and provides 250,000 lumens of illumination over 50,000 hours, compared to the 2,500 hours offered by standard 150 watt PAR38 halogen lamps. The LED PAR38 lamps have a lower energy consumption, produce more light output, are more durable to abuse and harsh environments, which translates into less maintenance and huge savings long term. These temporary construction LED string lights consist of 100’ of 14/2 SJTW cable, with 10’ between each lamp and terminated in a 3’ whip on the front and back ends of a total of 106’ of durable, weather proof string lighting. Utilizing energy efficient LED lamps, operators are able to provide more light coverage from the same amp draw, or lower the amp draw using the same amount of LED lamps as halogen. Each LED trouble light has an effective range that approximately covers a 15’ to 20’ radius with a 60° flood beam. These lights are configured to operate with 120V-277VAC or 12-24VDC without any modifications. These LED lamps are suitable for wet areas, extremely long lived, resistant to damage form impacts and vibrations, and consume far less energy than standard lamps.